Justices questioned whether revealing the name would risk physical harm to the supplier — or only hurt its business. The Texas prison system has argued for years that the identity of an execution drug supplier must be kept secret to avoid endangering the supplier. But as the Texas Supreme Court weighed naming the company in oral arguments Wednesday morning, the justices questioned if the potential threat would be to physical safety or simply to the pharmacy's business interests. In 2014, three lawyers who represent death row inmates filed suit to reveal the name of a pharmacy that supplied pentobarbital — the sole drug used in Texas executions. They have argued the information was necessary to ensure the drugs were safe at a time when multiple states held "botched" executions with new drug combinations and struggled to find lethal doses. The Texas prison system claims the information should be withheld in order to avoid endangering the supplier. Court precedent allows for withholding public information if its release could cause a “substantial threat of physical harm.” But the lawyers and the state disagree on how that standard is met. So far, lower courts have sided with releasing the name. Originally, the Texas Supreme Court also declined to hear the appeal from the Texas Department of Criminal Justice, indicating that the state soon would be forced to reveal the pharmacy's identity. 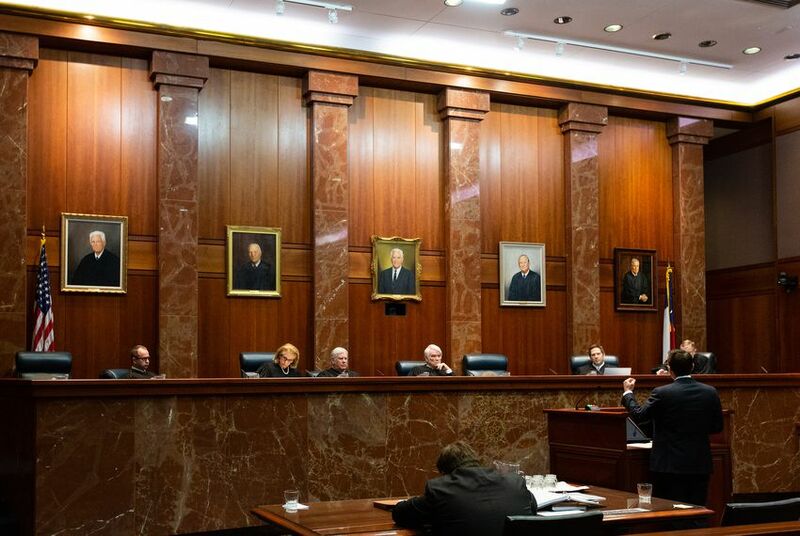 But the justices changed their minds after the state filed a motion for a rehearing and focused on a broader claim: that naming the pharmacy could cut off the state's supply of drugs and end the death penalty in Texas. The arguments Wednesday, however, focused largely on what a potential threat to the named supplier would be. Justices Eva Guzman and Jimmy Blacklock recused themselves, leaving only six justices on the bench. “It is … intuitive and straightforward that someone might want to do harm to the individuals who provide the thing the state needs to carry out the death penalty,” said Ari Cuenin, an attorney for the Texas Attorney General’s Office, noting the precedent set in a case in which the court allowed details of the governor’s security team to be kept secret to thwart potential attackers. Hecht followed up by noting that pharmacies identified in the past faced no actual threats of violence. Cuenin said that was because they stopped selling drugs to the prison system after protests. Law enforcement has to assume someone who continued to sell the drugs would see threats escalate. Diving deeper into the likelihood of a threat of physical harm, Philip Durst, who argued on behalf of the death row attorneys, talked at length about the bar the state must surpass to keep information secret. It needs to be likely that a substantial threat would follow revealing the pharmacy's identity, not simply a possibility of one, he said. “They can’t have a vague assertion of risk,” he said. Justice Paul Green asked how much more weight should be given to opinions of law enforcement officers, who conduct threat assessments and "know a lot more about this than the judges on this panel.” He referred to the threat assessment conducted by the Texas Department of Public Safety in 2014 at the request of the prison system, which said that naming a supplier could be dangerous. An underlying question throughout the hearing and this case has been why the lawyers need the name. Cuenin argued that the prison system gave the lawyers information on purity levels of the drugs and when they were last tested — all that was withheld was the name of the pharmacy. Durst argued that in light of botched executions and the deaths taking longer, it was necessary to get the information about the pharmacy to get more transparency and ensure the results they were showing were accurate. Durst also brought up a pharmacy recently named by BuzzFeed. The news outlet named Houston’s Greenpark Compounding Pharmacy as an execution drug supplier for Texas in November, and Durst pushed to discuss the new revelation in court in a recent letter. The court is expected to issue a ruling in the case sometime between late April and the end of June, according to the court clerk.